What would happen if mages from different magic schools came to an arena to fight a dead man? An illusionist facing a druid, a wizard facing a druid or a priest facing a magician? 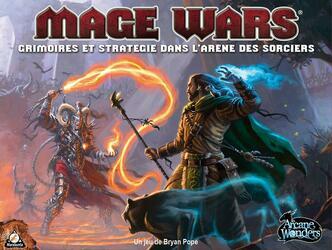 Mage Wars is a game that combines the mechanisms of card and figure games and will allow you to create this type of confrontation. Contents of the box : 1 "Arena" board, 2 spell books, 322 "spell" cards, 4 "Mage" cards, 4 "Mage Ability" cards, 2 "Mage Status" boards, 8 "Status" cubes, 20 "Action" markers, 2 "Quick Exit" markers, 9 attack dice, 1 effect die (d12), 24 damage counters, 8 Mana counters, 7 Guard markers, 6 Ready markers, 20 Condition markers, 3 Entitlement markers, 1 Initiative marker, 1 Game rule.